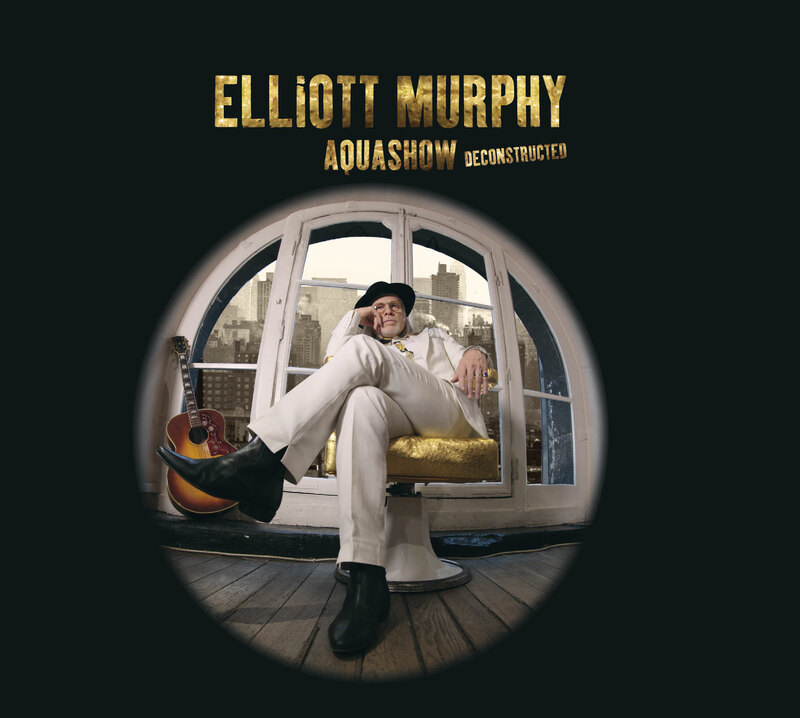 Elliott Murphy caused quite a stir with Aquashow, his 1973 debut album. Rolling Stone, for example, devoted considerably more space to its review of the record than to a critique of Springsteen’s first album in the same issue, with writer Paul Nelson calling the LP “magic” and labeling its final track “one of the must beautiful in popular music.” Other critics, including yours truly, piled on the praise as well. One reason the spotlight fell on Murphy is that he was blessed and cursed with being the latest in a series of “new Dylans.” (Rolling Stone dubbed his album “the best Dylan since 1968.”) In fact, Murphy didn’t sound all that much like Bob Dylan, musically or vocally, but he did share that artist’s love of words and Blonde on Blonde-era tendency to pack his songs with great numbers of them, including nouns turned into modifiers. (Aquashow’s “Poise ’n Pen” even had a “magazine wife” while Dylan’s “Sad-Eyed Lady of the Lowlands” had a “magazine husband”). But if the Dylan tag attracted people’s attention, it was Murphy’s talent that held it. Aquashow was a fine first record, loaded with rock and roll spirit and indelible songs about the Long Island suburban life the artist had grown up with and the New York City and European life to which he’d fled. The spotlight on Murphy (who wrote the foreword for my book Springsteen on Springsteen in 2013) pretty much went away after four major-label albums, but the good news is that he garnered enough of a cult following to continue a career that has now spanned more than 40 years and dozens of great recordings. And Aquashow has endured, both as one of the most noteworthy albums of the 70s and a mainstay of Murphy’s live act. Thinking about the album last year, he concocted the idea for this new package. As he explains in the liner notes, “I decided we should record these [Aquashow] songs again, in a different way, deconstructed if you will, and maintaining a certain integrity with the original. We retained the same tempos, keys and of course lyrics and tried to give Aquashow a second life, bridging the last century to the current one.” That’s exactly what he does on Aquashow Deconstructed, which offers new readings of every track on the original LP, presented in the same sequence. Murphy mentions in the liner notes that his son Gaspard, who now serves as his producer, is 24, the same age he was when he recorded the original Aquashow; and the booklet that accompanies the new album includes his 1967 high school graduation picture, a photo of his band being signed to their original record contract and a 1949 poster for his father’s water-show extravaganza, the source of the album’s name. But Aquashow Deconstructed is not an exercise in nostalgia. Murphy is interested in examining the person he was when he started out, but also in taking a fresh look at his early subjects and contemplating how far he has come. On the evidence of this album, he has come far indeed. While a few tracks, such as the terrific “Hangin’ Out” and “Graveyard Scrapbook,” are at least relatively unchanged, many of the tunes have been rebuilt from the ground up with fascinating results. Notwithstanding Murphy’s comment about retaining original tempos, some songs have been slowed down. His voice—and therefore his lyrics—are much more prominent here than on Aquashow. Instead of a full-band backup, we often hear just acoustic guitar or piano; occasionally, Murphy even sings a cappella. One quick conclusion: he’s a much stronger and more self-assured singer now than he was 40 years ago. One of the most notable reinventions on the new record is “Last of the Rock Stars,” the leadoff track. Listening to the original version, you hear the voice of an exuberant teenager who waits all week to see the latest rockers on Ed Sullivan and who doesn’t care that his homework is incomplete because he’s “got that beat.” Those lyrics are still present, but, slowed down for the remake, the song now sounds almost dirge-like and feels like an older man’s somber meditation on fame. (It occurs to me that it would make a good segue into Counting Crows’ “Mr. Jones.”) Similarly effective are ”Hometown” and “How’s the Family,” two songs that seem to describe empty suburban lives and that remind me a bit of the brilliant film Ordinary People. In the original album, both are mid-tempo rockers that rely heavily on guitar and harmonica; on Deconstructed, Murphy’s voice is more powerful, prominent and emotional and the backup features mournful violin and ominous-sounding piano. Aquashow remains indispensable but now, so is Aquashow Deconstructed. It’s a considerably better record than its progenitor and that’s saying plenty.